Herbert Ruud was born on June 20, 1920, in Osnabrock, North Dakota. 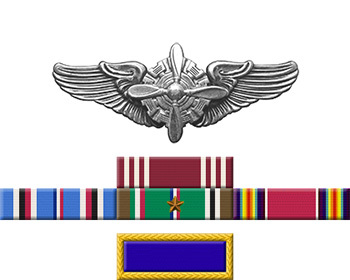 He enlisted in the U.S. Army Air Forces on August 19, 1942, and then completed basic training, followed by technical training at Shephard Field, Texas; flexible gunnery school at Fort Meyers, Florida; B-25 Mitchell crew training at Myrtle Beach, South Carolina; and B-29 Superfortress crew training at Chanute Field, Illinois, and at Seattle, Washington. Instead of going to B-29's, he was sent to a B-17 Flying Fortress crew training group in Pyote, Texas, and was assigned to the 337th Bomb Squadron of the 96th Bomb Group in England in December 1943. 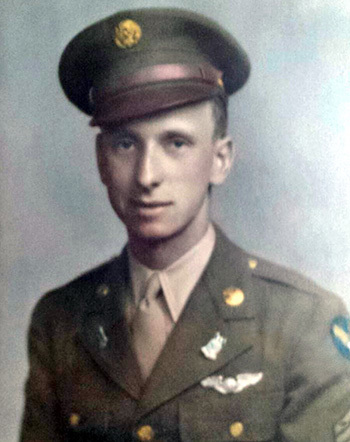 Sgt Ruud served as a flight engineer and top turret gunner on the B-17, and was shot down over France while flying his first combat mission on January 5, 1944. He was aided by the French Underground across the Pyrenees Mountains into Spain, where he was able to make his way back to England in March 1944. Sgt Ruud returned to the U.S. in April 1944, and served with the 3030th Army Air Force Base Unit at Roswell Field, New Mexico, until his honorable discharge on October 27, 1945. Herbert Ruud died on March 26, 2012, and was buried at Floral Hills Cemetery and Funeral Home in Lynnwood, Washington.